Best Energy Enhancements for the Buck……. High utility bills from our unusually cold winter are causing many people to consider energy efficient upgrades. Some energy enhancements offer more bang for the buck. 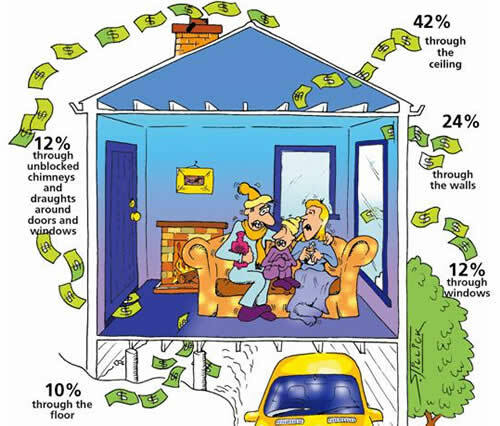 For example; Adding insulation, especially in the attic, is a low-cost way to reduce utility bills. However, replacing windows requires a huge upfront cost, which you probably won’t live long enough to earn back. Therefore, it’s good to know which upgrades offer the highest return before writing a huge check to your local contractor. Seal and insulate duct work through unfinished and unheated areas, such as the attic, garage, and crawl spaces. Add insulation to unfinished and unheated areas. Install a programmable thermostat so you don’t overheat your house when you’re away or while you are asleep. Seal air leaks around windows, doors, attic access, and recessed lights. Need a referral to a handyman to help with energy enhancements? Just ask and we’ll be happy to connect you with the right person for the job!